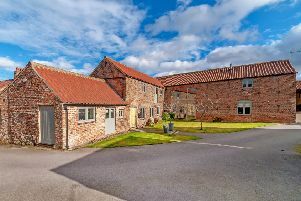 Old Manor Barn takes full advantage of the stunning views over the River Nidd and comes with full boating and riparian rights. The luxury dining kitchen has double French doors that give breath-taking views over the elevated terrace and the river beyond. Also featured are three bedrooms - the master with an en-suite shower room, two lower ground floor double bedrooms and Jack and Jill bathroom. There is also a lounge with oak floor and fully fitted study. Contact Dacre, Son & Hartley on 01423 864 126.